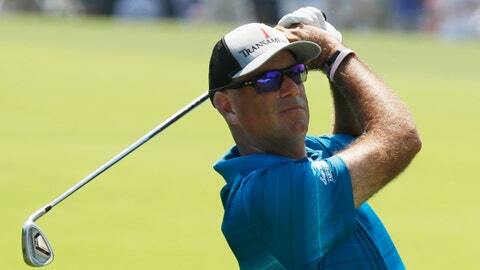 Six-time PGA Tour winner Stewart Cink moved to sixth place after a strong third round performance. ST. LOUIS – Stewart Cink felt as if he’d traveled back in time on Saturday, playing with Tiger Woods and all that entails — the massive crowds, the raucous cheering and the mind-bending intensity. Matt Wallace gave the massive crowds awaiting Tiger Woods in the group behind him a reason to warm up their throats when he aced the par-3 16th hole with a 5-iron. The 28-year-old Englishman, who has three European Tour victories on his resume, plucked his ball from the hole with a big smile. Then he rewarded those fans by chucking it into the crowd. The ace helped Wallace to a third-round 66. He’s 5 under for the championship. Brandon Stone was playing the same par-3 16th an hour later when he nearly holed out for an ace of his own. His ball hit the cup on the fly, ricocheting off the bottom of the flagstick back out. Stone covered his mouth in disbelief, asking whether it bounced out of the hole. The impact from the young South African’s shot left the hole damaged, and playing partner Thomas Pieters wanted to make sure he remembered it. So he pulled out his cellphone and snapped a pic. Stone wound up missing the putt. He still shot 69 and was 7 under for the tournament. Daniel Berger would’ve been forgiven for packing the clubs after his first nine Thursday. He had started his PGA Championship with two bogeys and a double, leaving him 6 over. The 25-year-old former Florida State star has only made one bogey since. Berger rallied to shoot 73 that opening day, then fired a rain-interrupted, second-round 66 to make the cut. He added a bogey-free 67 on Saturday to reach 5 under for the championship. Francesco Molinari‘s chances of becoming the first player since Padraig Harrington in 2008 to win the last two majors of the year are still alive after a 2-under 68 left him five shots off the lead. Molinari had gotten to 8 under for the championship after a birdie at the par-4 10th, but he dropped a shot at the 12th and then made all pars to hit the clubhouse at 7 under.